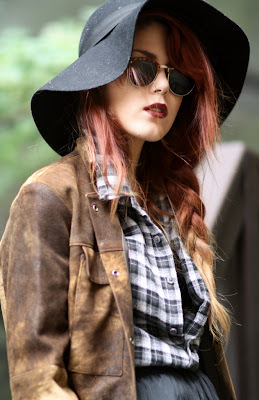 Some of you may have seen my post a couple of months ago about my current style inspiration genre- grunge (view it here). I don't know what it is but I seem to be drawn to all things rocky/grungy at the moment. I was even considering getting a nose ring, however it has become kind of overdone recently and I see sooo many people with them I decided against it... might just wear a fake one every now and again so that I dont have to deal with the pain and can take it out whenever I fancy! On a completely different note, I tried out the 'scouse brow' the other day. I love eyebrows so thought I would give it a go, I think it looks a little scary, even more so in real life! I love the grunge look, just wish i had the clothes to achieve it haha! I'm running a giveaway on my blog to win an American Apparel clutch or Models Own nail varnishes - please check it out! Your hair is pretty similar! p.s. your eyebrows look good!